C# refers to a popular and effective multi-paradigm programming language which covers strong typing, declarative, generic, functional, class-based or object-oriented, component-oriented and imperative programming disciplines. This programming language was primarily developed and introduced by Microsoft and is now one of those languages that are specifically used for common language infrastructure. What makes C# beneficial is that it is extremely useful and compatible for hundreds of development needs. It has numerous design goals and these include to work as a simple yet object-oriented, modern and general-purpose programming language, offer support for major principles used in software engineering including immediate detection of specific attempts to access and utilize uninitialized variables, instant and automatic collection of garbage, strong type checking and array bounds checking, improve the robustness and durability of a software program and the productivity of a programmer and establish software components that can be suitably deployed in distributed environments. C# also works in improving the portability of programmers and source codes, supporting internalization, effectively writing applications for embedded and hosted systems and in boosting the economical nature of processing power and memory requirements. It should also be noted that even if C# is taken out of C programming language, it still comes with its own unique and remarkable features that make it even more useful. These include garbage collection, extensive class library, exception handling support, separation of numerous interfaces from the actual implementation and different polymorphism types. It also comes with generics, multi-platform support and powerful development tools that make it more effective for all software development projects. If you want to gain a more complete understanding about the C# programming language, then it is advisable for you to check out the C# certification course offered by Brainmeasures. This C# course offered by Brainmeasures is the most suitable online certification course for you because it walks you through all the essential concepts and terms associated to the programming language. It allows you to access a comprehensive C# training which gives you the opportunity to obtain more familiarity about the programming language, its programming functions, its most essential features, its major objectives and different versions. 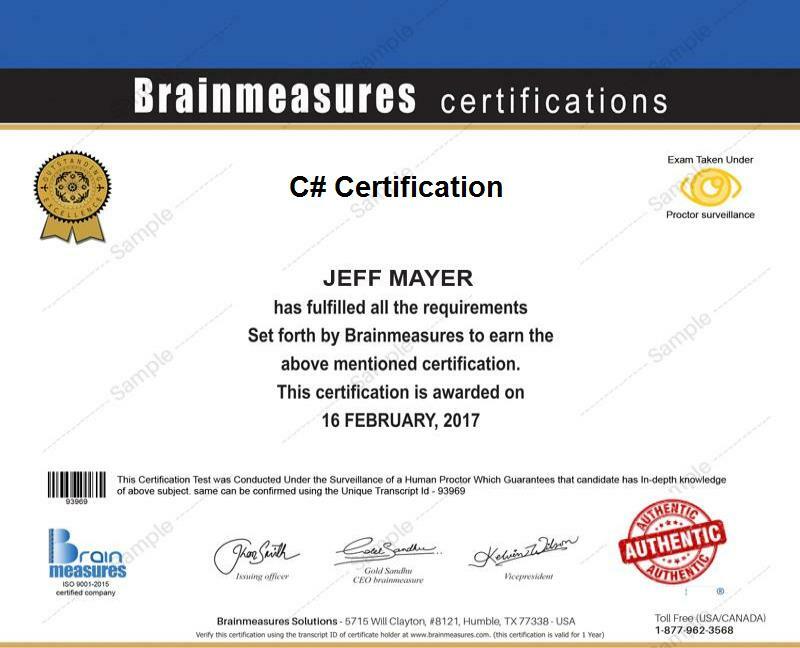 If you are a programmer or an aspiring programmer, then earning a C# certificate from Brainmeasures is indeed a wise move considering its effectiveness to deliver the highest quality of information about the language. How to effectively create and manipulate arithmetic expressions? How to effectively convert strings into numbers? The C# certification program offered by Brainmeasures is developed in such a way that it will benefit a lot of present and aspiring users of the C# programming language. You can expect this certification course to work even more suitably for existing and aspiring programmers, developers, coders, software and network administrators, IT professionals and any other individuals and professionals who are greatly interested about performing programming tasks using C#. You can also expect your salary to dramatically increase after you complete your C# certification course and get jobs related to the field. If you use your C# certification to work as a C# developer or programmer, then you can expect to earn approximately $86,000 to $103,000 per year. You may also get the position of a C# consultant which usually offers a very rewarding salary within the range of $76,000 to $119,000 annually.